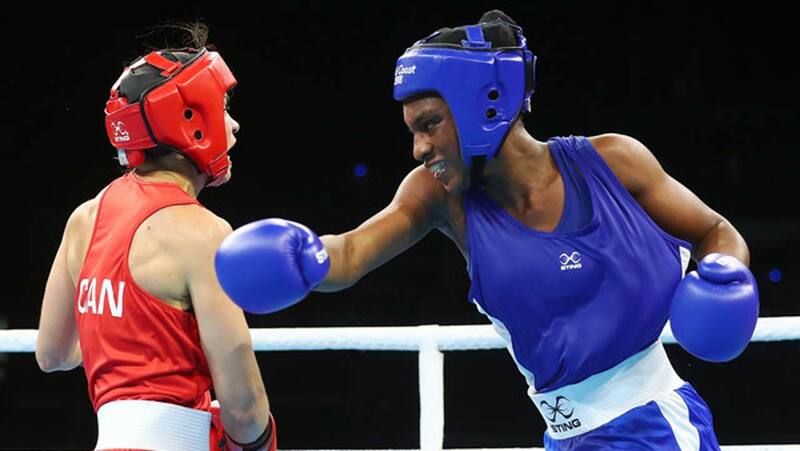 Nigeria’s female boxer, Yetunde Odunuga yesterday qualified of the semifinal of the lightweight boxing class (60kg), just as the country’s medallists were showered with dollars by grateful officials of the Sports Ministry. Odunuga was awarded the fight against Caroline Veyre of Canada following a verdict of Referee Stop Contest (RSC). Veyre was ahead in the scorecard in both round one and two before the contest was stopped. She dominated round one 10-9, 9-10, 10-9, 10-9, 10-9 and edged round two 9-10, 10-9, 10-9, 10-9, 9-10. Yesterday, the sports ministry made good its promise to reward athletes who excel at the ongoing games. In a brief presentation ceremony, athletes who won gold medals including Para Powerlifters Ibrahim Abdulazeez, Rowland Ezurike, Ndidi Nwosu and Esther Oyema received $5,000 each, while Silver medalists like Lucy Ejike, Kehinde Paul and Shot put thrower Chukwuebuka Enekwechi got $3,000 each. Bronze medalists got $2,000, while coaches of the gold medalists got $5,000 each and coaches of silver medalists got $3,000. The Table Tennis squad comprising Segun Toriola, Bode Abiodun, Azeez Jamiu and Omotayo Olajide received $9,000. The Para Powerlifting champions also got extra cash awards from their president, Queen Uboh, who gave each gold medalist N100,000 and the coaches, while the silver medalists got N50,000 each. Meanwhile, Team Nigeria’s miserable performance in athletics continued yesterday, as one of the nation’s medal hopefuls in the women’s 400m, Yinka Ajayi put up a disappointing show in the final. After the duo of Seye Ogunlewe and Enoch Adegoke finished outside the medal zone in the men’s 100m earlier in the competition, focus shifted to Ajayi to redeem the nation’s image on the track yesterday. The Nigerian made it to the final of the 400m only to finish eight with a disappointing time of 52.26 seconds in a race won by Botswana’ Amantle Montsho in 50.19seconds. National Record (NR) holder in the women’s Javelin throw, Kelechi Nwanaga ranked sixth in the final of the women’s Javelin, as she threw a best mark of 53.17m. Also, the duo of Praise Idamadudu and Isoken Igbinosun both finished in the seventh place in the women’s 200m semi-finals respectively. Idamadudu crossed the finish line in a time of 23.69s, while Igbinosun posted a time of 24.03s. The country’s only male athlete in the half-lap event, Emmanuel Arowolo placed eighth as he finished in a time of 21.25s. Equally, Precious Okoronkwo placed 14th overall in the long jump qualifying round B after leaping to a distance of 6.12m. In another development, eight Camerounians athletes have gone missing from their accommodation at the Commonwealth Games, team officials confirmed yesterday. Press attaché, Simon Molombe, told the BBC that officials viewed it as “desertion” and that the missing athletes had been reported to Australian police. “The authorities are very disappointed with the deserters – some did not even compete,” Mr. Molombe said.